Founded in 1999 by Brothers Charlie and Ed Shelton, Shelton Vineyards was envisioned as a new agricultural resource for an area once dependent on tobacco farming. Located in the heart of North Carolina’s Yadkin Valley, Shelton Vineyards is 180 degrees from any winery you will find on the West Coast. The distinctive characteristics of Shelton wine come from the unique soil and climate of the Yadkin Valley. This helps give Shelton wine an inimitable taste that holds its own against any wine from any area in the world. We invite you to visit us, try our wine and see if you agree that our wine is as unique as the area we are in. Welcome to Vineyards on the Scuppernong. 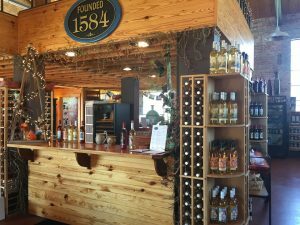 We are home to a wonderful selection of wines made from the world’s healthiest grapes, grown, produced and bottled fresh here in eastern North Carolina. Visit us at our winery or tasting room and experience for yourself how varied the wines can be from this grape. Our tasting room is in a beautifully restored, brick building in the town of Columbia, North Carolina. 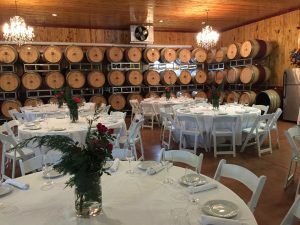 A picturesque, small town perched on the banks of the Scuppernong River – the perfect setting for a taste of the wines that are so much a part of the history of this region. 10:30 p.m. – 5:00 p.m.
Winemaking has been a lifelong dream turned reality for entrepreneurs and wine enthusiasts JW and Kristen Ray. 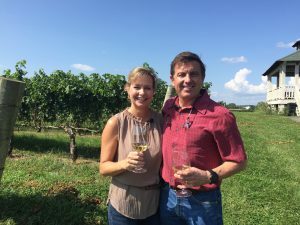 The search for the perfect place for the winery brought them to the historic Yadkin Valley AVA. The rolling hills, now home to JOLO, are perched over 900 feet above sea level in the foothills of the Piedmont region boasting majestic views of Pilot Mountain. Previously, the vineyard estate had not been used for widespread agricultural purposes due to the rocky soil and hilly nature of the property. However, what is less ideal for farming makes for perfect conditions for world class grape growing. Most of the souths facing sections in the vineyard require hand farming as the terrain is too steep for tractors. Thus our goal is to not compete on price but to provide inimitable guest services alongside superior wine production in North Carolina. Laura, the episode will be available online soon as well as through Roku/PBS. Once it is posted, I will send you the link. The Ray Family were great to work with and did such a wonderful job representing NC Wine! Thank You Lisa Prince for all your nice work in reporting on UNC. TV. Especially from the vineyard where I met you about 6 years so. Your Awesome on TV. Signed Ray B.